In the red city of Marrakesh, step back in time as you wander through the Jemaa-el-Fna, a square and exotic bizarre offering some of the greatest open-air entertainment. Listen to the storytellers—an integral part of the culture—and browse for handicrafts. It’s not hard to imagine what it was like in the past, a time when caravans loaded their camels with food and goods to sell at the markets. In Fez, take an optional tour to see the ancient medina. Founded in the 9th century, it is one of the largest medieval cities in the world and now a UNESCO World Heritage Site. Stroll through its souks (markets) and alleys, which are virtually unchanged since the Middle Ages. 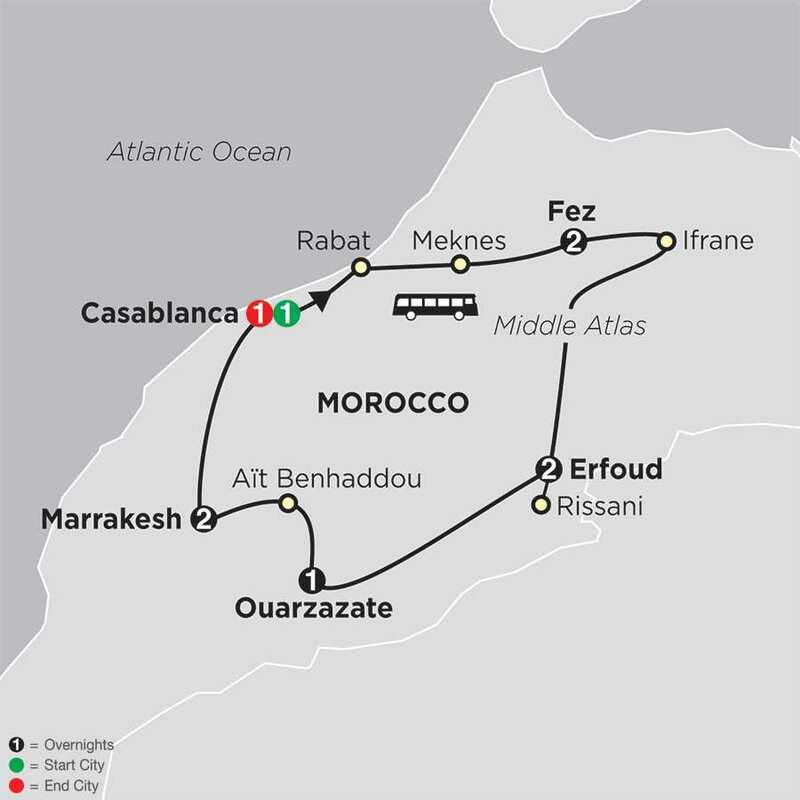 On this Morocco tour, you’ll also visit Casablanca and its newly built great Mosque; Meknes, where you’ll visit the royal stables built to house 12,000 of the royal horses, and see its monumental gates, mosque, palace, and miles of protective walls; Ouarzazate, where you’ll visit the Kasbah de Taourirt, built in the early 19th century and used as a base for the powerful el Glaoui tribe, who controlled the caravan route through the region; the alpine mountain resort of Ifrane; Erfoud, the gateway to the Sahara desert; and Rabat, Morocco’s vibrant capital where you’ll visit the relics of Chellah, a city built by the Romans in 40 AD. From the Middle Atlas mountain range and Ziz Gorges to arid desert, this Morocco vacation will amaze you with spectacular scenery. This Morocco tour is truly a once-in-a-lifetime vacation. Visits to Fez, Ifrane, Erfoud, Rissani Mausoleum of Moulay Ali Sharif, Ouarzazate Kasbah de Taurint, Aït Benhaddou. Single supplement add from $636, Guaranteed Shares are on request. Post night hotel room on request. Note: Cosmos requires passport and emergency contact information with final payment. Welcome Back Program: Beginning in 2019, each time you travel on a Globus family of brands vacation (Globus, Cosmos, Monograms & Avalon Waterways), you can earn up to a $275 per person Welcome Back Credit to use towards your next vacation. There’s no enrolment necessary, no membership card or membership numbers. It’s simple – travel more, earn more! Arrive and check into your 1 night pre-tour hotel. You will have the day to explore Casablanca until your tour begins. A short ride along the coast to Rabat, once a lair of the corsairs and now the country’s capital. Sightseeing includes the Royal Palace, Hassan Tower, and the Kasbah of Oudayas. You are reminded of the time when Morocco was the Roman province of Mauretania as you visit the fine ROMAN RELICS OF CHELLAH and its GARDENS. Continue to Meknes—during your guided tour, see its monumental gates, mosque, palace, and miles of protective walls. Visit its ROYAL STABLES, originally built to house 12.000 of the royal horses. Travel east towards Fez, Morocco’s most enchanting city. At leisure in ancient Fez, which occupies a position of outstanding scenic beauty. Visit the exotic ancient Medina on the optional sightseeing tour, a maze of narrow, bustling streets and alleys that are home to colorful souks. Travel today into the very heart of Morocco. Stop in the quiet, French-built alpine mountain resort of Ifrane. Verdant cedar forests give way to volcanic mountains and wind-swept plains as you motor across the Middle Atlas range. Pass fortified mud-and-straw villages and descend into the spectacular ZIZ GORGES. The landscape becomes progressively more arid and you enter a stony desert. Approaching Erfoud, an unexpected and breathtaking surprise: the peaceful oasis of the Ziz Valley. Enjoy the drive through the eastern slopes of the Atlas Mountains and arrive at the Tinerhir oasis with its green valley of palms and local villages. On to the impressive Todra Gorge, then along the Dades Valley to the film capital of Morocco, Ouarzazate, where you’ll visit the KASBAH DE TAOURIRT, the intricate but fascinating residence of Pasha Thami el Glaoui. Travel to AÏT BENHADDOU, a kasbah famous as a film location for Lawrence of Arabia and Gladiator. Pass through picturesque villages surrounded by craggy mountains towards 7,414-foot-high Tizi-n-Tichka Pass in the heart of the High Atlas Mountains. Each new twist in the road leads to a different, more dramatic landscape. Leaving the pass behind, the landscape gradually changes to a tapestry of red ochre. Enter the gates of the red-colored imperial city of Marrakesh, justly reputed the most fascinating of all Moroccan cities. An optional evening excursion is a fitting way to end the day. The included city sightseeing with a Local Guide starts with an orientation drive followed by a walk through the ancient quarters to the fascinating JEMAA-EL-FNA SQUARE and its exotic bazaar, BAHIA PALACE, and SAADIAN TOMBS. You’ll really feel as if you’ve stopped the march of time. Leave Morocco’s magical city of Marrakesh for the journey back to Casablanca. In the afternoon, see the sights in the company of a Local Guide. Exclusive: $50 USD per cabin on board credit!